Two plainclothes police officers outside leading the man in handcuffs. A 22-year-old man has been arrested at Sydney Airport as he was allegedly attempting to leave for Syria. It is a crime for Australian citizens to travel to parts of Syria, including areas controlled by the Islamic State (IS) militant group. New South Wales Police said the man was arrested at 10:00 local time on Thursday (midnight GMT). They said it was part of an ongoing investigation and there was no impending threat to the public. 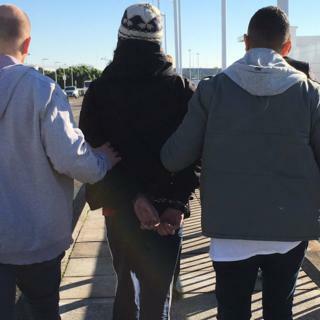 The police shared a picture on Twitter showing two plainclothes officers outside the terminal leading the man in handcuffs. He was known to police for minor matters and had been under surveillance in the five months leading up to his arrest. NSW Police Deputy Commissioner Dave Hudson said the man was expected to be charged with preparations for incursion into a foreign territory to commit acts of violence. The charge carries a maximum penalty of life imprisonment. “It appears he was radicalised online,” Dep. Comm. Dave Hudson said.